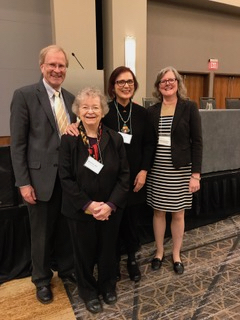 Distinguished Professor of Music, Maureen Carr, was presented with the Ruth A. Solie Award at the 2018 meeting of the American Musicological Society in San Antonio, Texas, for a book entitled The Rite of Spring at 100 (Indiana University Press, 2017). The award citation read: "This book of essays applies multidisciplinary approaches to ongoing questions about a central work by Stravinsky. The contributors include an international group of authors drawn from dance and theater specialists, musicologists, and music theorists. They address controversies regarding the genesis and reception of the work, including issues such as: modernism and primitivism, immigration and xenophobia, as well as nationalism and racism. The editors [Maureen Carr, Severine Neff, Professor Emerita of Music at University of North Carolina, Chapel Hill, and Gretchen Horlacher, Professor of Music at Indiana University] played a strong role by organizing international conferences that generated essays for the volume, by fostering dialogue among the authors, and by arranging for inclusion of video and audio clips. A scholar of the music of Igor Stravinky, Carr has studied his manuscripts and other documents extensively at the Stravinsky Archive of the Paul Sacher Stiftung in Basel, Switzerland, as well as at archives in Paris and London. She previously received a Citation of Special Merit for Stravinsky’s Pulcinella from the Society for Music Theory at its 2011 national meeting in Minneapolis and an award from the Otto Kinkeldey Endowment of the American Musicological Society in support of her book After the Rite: Stravinsky's Path to Neoclassicism. The American Musicological Society was founded in 1934 as a non-profit organization to advance research in the various fields of music as a branch of learning and scholarship. At present, 3,000 individual members and 800 institutional subscribers from forty nations are on the rolls of the Society. The Solie Award honors a collection of musicological essays of exceptional merit published during the previous year in any language and in any country and edited by a scholar or scholars, one of whom is a member of the AMS or citizen or permanent resident of Canada or the United States.